Buffalo Bill’s Cowboy Band was organized and directed by William Sweeney. 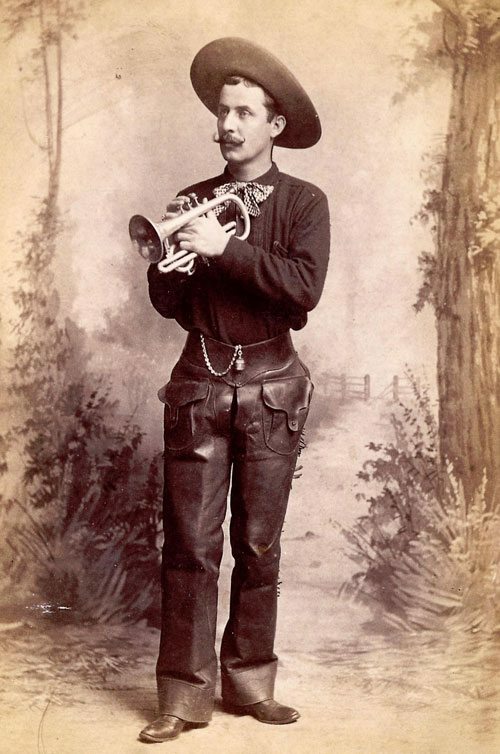 A cornet player, Sweeney was the leader of the Cowboy Band from 1883 until 1913. He began his career with William F. Cody in 1882 in North Platte, Nebraska, when Cody orchestrated what later became known as the “Old Glory Blowout.” A Fourth of July celebration often considered the precursor to Buffalo Bill’s Wild West, the Old Glory Blowout also included the first “organized” rodeo in the United States. The Wild West, with Sweeney as band leader, launched in 1883, with its first staging a dress rehearsal held in Colville (now Columbus), Nebraska, on May 10. The first public performance took place May 19 and 20, 1883, in Omaha, Nebraska. Sweeney remained with Buffalo Bill’s Wild West for thirty years, until the “Farewell Tour” with Buffalo Bill and Pawnee Bill Lillie’s “Two Bills” Show in 1913. Sweeney did all of the arrangements and wrote a majority of the music performed by the Cowboy Band. Buffalo Bill wrote about how “appropriate the music from Mr. Sweeney’s Cowboy Band” was to the show’s scenes of American history. Some fifty years before it became America’s official national anthem in 1931, the “Star-Spangled Banner” provided the official musical opening for each Wild West show. Because of this thirty-year tradition, it could be argued that Sweeney and the Cowboy Band greatly influenced the general public’s acceptance of the “Star Spangled Banner” as our national anthem. To learn more about Buffalo Bill’s Cowboy Band, click here.